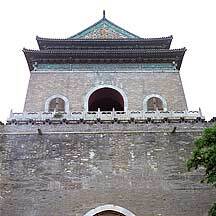 The entrance arch to 前门 Qianmen Gate. 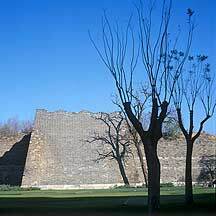 One of the remaining city walls. 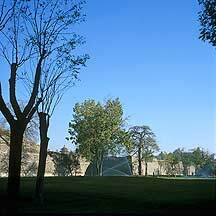 Around the ruined wall is a park. 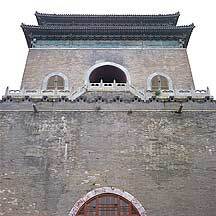 Beijing's heavy-duty bell tower. 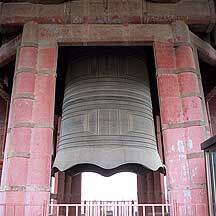 Here hangs one of China's largest and heaviest cast-iron bell. Tourist pedicabs lined the way to the bell tower. 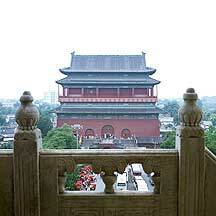 View of the bell tower from atop the drum tower. A memorial stone outside the bell tower. 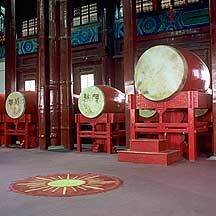 This colossal cast-iron bell is one of the three largest in China today. The bells (I believe there were 9 of them) were struck every half hour for the tourists. 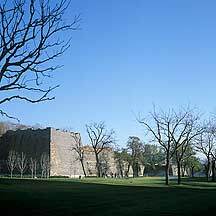 北海 Beihai is the imperial garden of the 金 Jin, 元 Yuan, 明 Ming and 清 Qing dynasties. 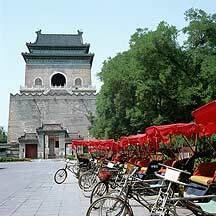 It is the oldest and best preserved imperial garden in China. 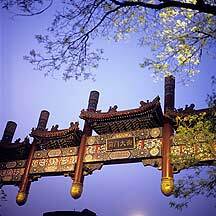 王虎井 Wanghujing is a popular shopping and tourist center in Beijing city. Bronze cast statures of two musicians playing erlu and singing in the street. One of the wide crossroads in the area. Despite the growing possession of cars, bicycle is still clearly in much use. In the 王虎井 Wanghujing commercial area. A church near the 王虎井 Wanghujing commercial area. The little girl danced every time she came out of a clothing shop that she hangs around. 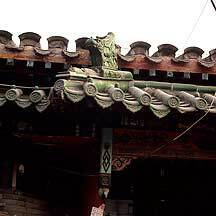 Roof details of a house inside a 胡同 hutong. Daily exercise is a routine in China. There are exercising equipments in public parks and streets. 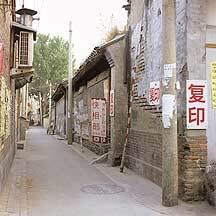 I was staying in a hotel within this hutong during the 2 times (2004 and 2006) I was here. The hutong was in the process of being cleared for, I am assuming, commercial projects. The hutong stretched all the way to 前门 Qianmen leading to the Tiananmen Square. Much of it was already cleared. The same hutong. 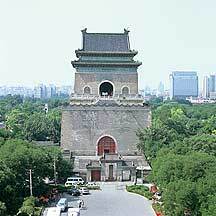 This is the 前门 Qianmen end of the long road. 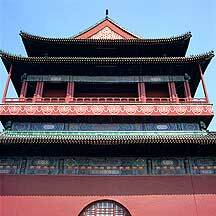 Chinese characters on top of the doorway,"四时平安“ (peace, tranquility, and general wellness throughout the 4 seasons).